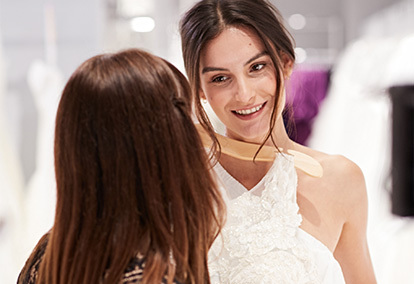 For a dress that fits perfectly, start with a size that's right for you (we have plus size, petite, and extra length), then let our in-store alterations specialists work their magic. Here are a few things to know about alterations and dress fittings. Why should I have my dress altered at David's Bridal? Every one of our 300+ locations has on-site alterations specialists who know our dresses inside and out, from the unique construction to the carefully crafted details. They can alter any wedding dresses, bridesmaid dresses, and social occasion dresses purchased at our stores or website. We recommend making the appointment for your first fitting when you buy your dress. An alterations specialist will create a specific timeline based on your event date. Please allow 4 weeks between the first fitting and the pickup fitting. 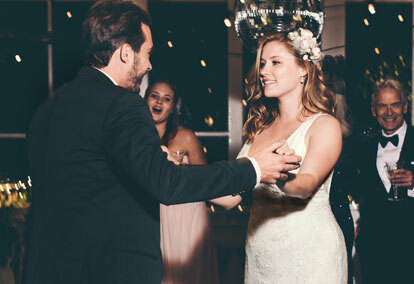 How can I personalize my dress? Sleeves: Add cap sleeves, short sleeves, or long sleeves to any strapless wedding dress. Corset backs: Swap a zipper closure for one that laces up (and gives extra breathing room). Bustles: Create a different look for the reception by lifting up your train with a bustle. What happens at the first fitting? First fittings take about an hour for wedding dresses and half an hour for bridesmaid or formal dresses. You'll try on your dress, and a specialist will pin it to show you the best alterations for an ideal fit. 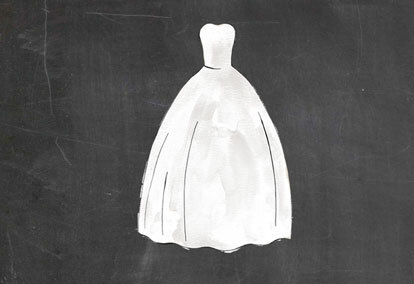 For wedding dresses with a train, you'll see bustle options. What should I bring to my fittings? To ensure the perfect fit, bring the bra, slip, shapewear, and shoes you plan to wear with your dress. The right lingerie can change everything. Ask one or two trusted friends. If your gown has a long train, invite your maid of honour to the final fitting so she can learn how to bustle your gown for the big day. Pricing varies based on the complexity of the alterations, so we'll need to see you in the garment first. Payment is due at the time of your first fitting. Additional charges apply to rush orders. Our alterations services include a professional press and steam. If you're planning to have your dress altered elsewhere, we will steam your garment's outer layer before it leaves our store. To schedule an alterations appointment, call your local store.